Amputation surgery is one of the most traumatic experience a person can go through. Losing a limb is not only a huge psychological burden, it also brings along a whole range of daily inconveniences and can even do damage to the other parts of the body (back pain for example). To replace the missing limb prostheses have been developed. From a pirate’s wooden stick in the past to carbon or electronic prosthesis now. However, as much as there has been a big evolution already, these artificial limbs are still far from offering the same levels of comfort, flexibility, reliability or dexterity a human limb offers perfected through millions of years of evolution. Over the past decades, technology and research have greatly expanded the functionality and aesthetics of prosthetic feet. Today, amputees have a wide array of feet from which to choose. Various models are designed for activities ranging from walking, dancing and running to cycling, golfing, swimming and even snow skiing. Heavier wood and steel materials have been replaced over the years by lightweight plastics, metal alloys and carbon-fiber composites. Many of those can even store and return some of the energy generated during walking. However, despite all these advances, today’s prosthetic feet are still unable to mimic the natural functions of an intact ankle-foot. The overall majority of prostheses available are even non-articulated: they feel more or less as comfortable as walking with closed ski-boots. On the long run, the unnatural behaviour of a prosthesis leads to overcompensation of other articulations and brings pathologies such as, among others, severe back pain. 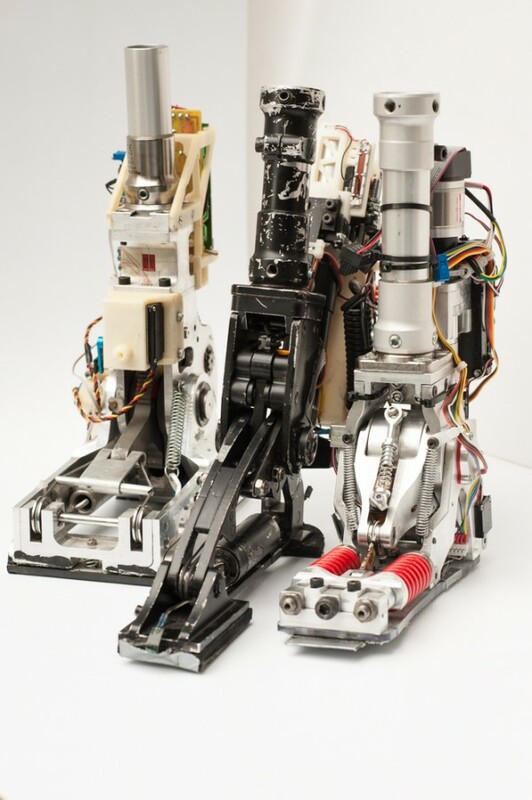 The Ankle Mimicking Prosthetic (AMP-) Foot project started nearly 10 years ago, within the walls of the Robotics & Multibody Mechanics (R&MM) research group at the VUB. The aim was simple: use robotic technologies inspired by our own human body to develop innovative prosthetic feet and to improve amputees’ life quality. A decade and 4 prototypes later, the state-of-the-art in bionic feet has been pushed one level further. We are happy to present our new prototype, the AMP-Foot 4, for the first time. 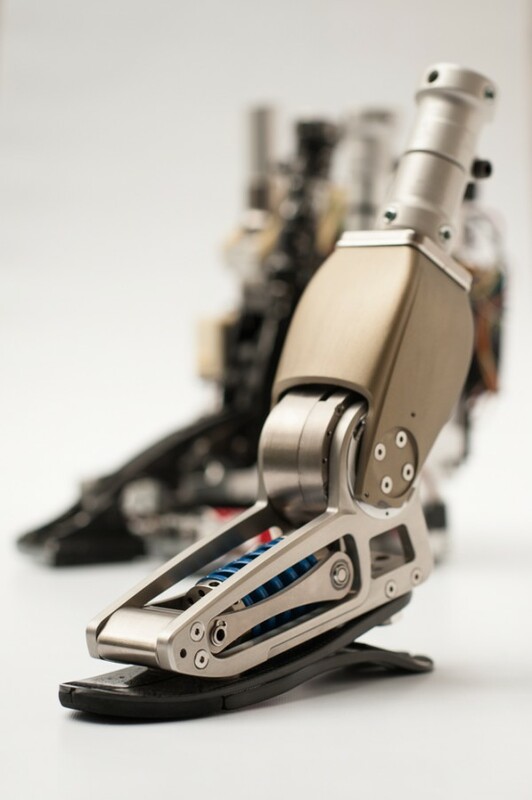 The technology of the AMP-Foot prostheses relies on 2 innovative mechatronical systems. The first one provides seamless, adaptable, and more important, natural response to different terrains, stride lengths, walking speeds and walking slopes which increases the overall stability and comfort of the wearer in daily life situations. The second system provides active propulsion, hereby taking over the lost functions of the calf muscles and Achilles tendon during walking. Thanks to this, the rest of the body does not need to overcompensate anymore during ambulation. The combination of both systems brings us one step closer to mimicking an intact ankle-foot. The newest member of the AMPFoot prototype family is the AMP-Foot 4. This next-gen prosthesis that we will present at Cybathlon for now only uses the first innovative system, which provides natural adaptability of the prosthesis to different terrains and slopes. By participating at the race we see an opportunity to compare our technology to the state-of-the-art devices, side by side, in daily life situations. But once again; for us there is only one race that really matters: the one to prosthetic devices that act and react as a sound human leg.